Among the interesting things happening at the International Trade Commission so far this month, there were three new Section 337 complaints, another challenge to post-importation inducement liability, and clarification on domestic R&D expenses. Since August 1, three new complaints have been filed at the ITC. Motorized Vehicles and Components Thereof: A complaint brought by Chrysler against Indian auto company Mahindra alleging infringement of registered trademarks and trade dress related to Chrysler's Jeep brand. 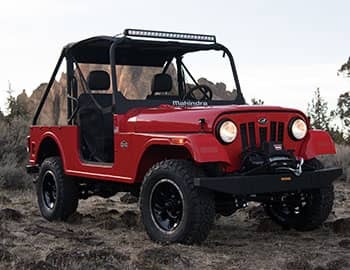 Mahindra operates a manufacturing plant in the Detroit area where it assembles a non-street-legal, off-road vehicle called the Roxor that it sells to U.S. consumers. Jeep claims the Roxor looks too much like a Jeep. Interestingly, Mahindra has long made officially-licensed Jeep-like vehicles for sale in India, but that license doesn't extend to the U.S. market. Beverage Dispensing Systems and Components Thereof: A complaint brought by Heineken against Anheuser-Busch alleging patent infringement related to draft beer dispensers. This complaint is an obvious retaliation for an ITC complaint Anheuser-Busch filed in April alleging infringement by Heineken of a patent related to beer kegs (Blow-Molded Bag-In-Container Devices, 337-TA-1115). Both complainants may face difficulty proving the existence of a domestic industry in their respective investigations. The two companies are European, and in each investigation the domestic industry product is an import designed abroad. Wireless Mesh Networking Products and Related Components Thereof: A complaint brought by SIPCO, a nonpracticing entity in the business of licensing and litigating patents related to wireless communication. The complaint is part of a long-running litigation campaign against Emerson Electric that has seen many of SIPCO's patent invalidated. To show a domestic industry, SIPCO is relying on its patent licensing activities as well various investments by Honeywell, a nonparticipating licensee. Emerson has already submitted an argument that an exclusion order would be contrary to the public interest because the SIPCO's patents are standard-essential. On August 8, FUJIFILM submitted a petition for the Commission to review a Final Initial Determination in X-Ray Breast Imaging Devices, 337-TA-1063. The petition argues that Section 337 should not apply when infringement requires a post-importation combination of the accused products and other domestically-sourced components. A public version of the Final Initial Determination has not yet been released, but it appears FUJIFILM and the ALJ disagreed about the scope of the holding in Suprema, Inc. v. ITC, in which the Federal Circuit permitted the ITC to exclude articles under Section 337 based on post-importation conduct in the United States that induced infringement. The question of how far that authority extends is also currently under review at the Federal Circuit in Comcast v. ITC. The Commission issued an opinion on August 1 in Robotic Vacuum Cleaning Devices, 337-TA-1057, that clarified how complainants can use research and development expenses to satisfy the domestic industry requirement. Respondents had argued a complainant relying on research and development activity to demonstrate a domestic industry needed to tie that investment specifically to the patented technology and not merely to a product using that technology. The ITC rejected that argument as contrary to long-standing practice at the Commission and the legislative intent behind the domestic industry requirement. The ITC held that "expenditures on plant and equipment and labor and capital employed in engineering and research and development activities [may be used] to support a domestic industry under subsections (A) and (B)." The decision doesn't change standard practice at the Commission, but it does clarify that Section 337's remedies are not reserved for domestic manufacturers but may also be enjoyed by patent owners with other sorts of domestic operations supporting foreign manufacturing activities.